August 15, 2017 August 16, 2017 Dr. R. A. 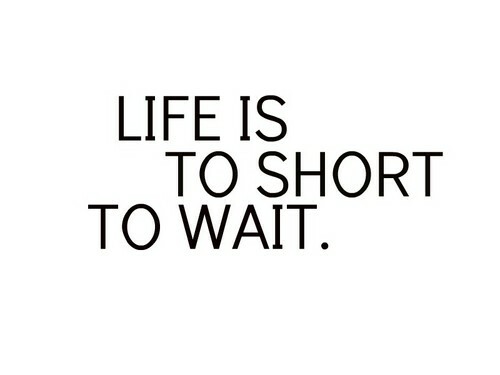 No one likes to wait. Waiting generally gives birth to anxiety and heightens our level of frustration. There is a story of a man who was praying to God for patience and told God to give him the patience needed in a hurry. 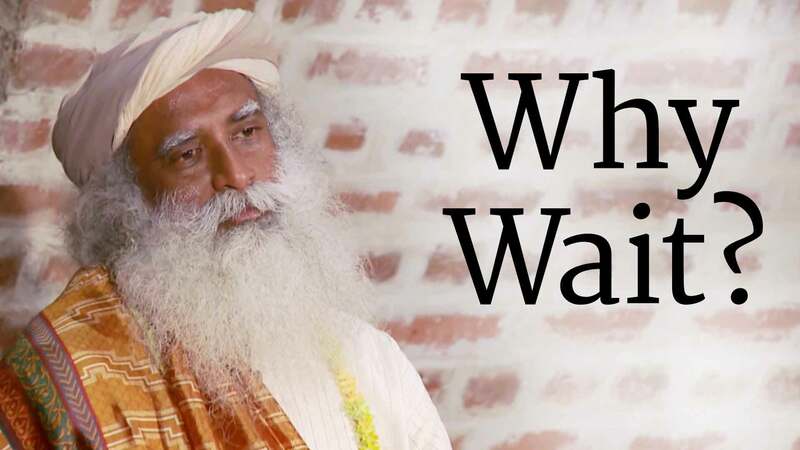 When I first heard the story I laughed but having gone through various situations in life where I had to wait and wanted the “waiting period” to end in a hurry, I can identify with the man in the story. In fact, there were times when I had to wait and my countenance was unbecoming. Truth be told I did not possess an excellent spirit in those circumstances. One would think that it is only waiting for extended period of times that would cause one to act out of the character of Christ. But I beg to differ and state that based on my own experiences that sometimes when I acted out of character I was not waiting for an extended period of time. Sometimes I became agitated because I thought someone was taking too long to order their food. Other times I became irritated because I thought traffic was moving too slowly. I chuckle because although we like to act like we behave godly at all times, it is far from the truth. Unfortunately, sometimes I become irate while driving and have come to understand how people have road rage. I wish I could say that was the height of my bad character trait as it relates to waiting, but regrettably I admit that these traits get carried over in my spiritual relationship. I realized that sometimes while I waited on the manifestation of the promise of God I became frustrated and often questioned His will and ability to work in my life. There are times that I have failed to understand His sovereignty and perfect timing. I have cried, sulked, and lost hope that He knows what I am going through and has my best interest at heart. Sometimes I have questioned whether or not I will see the expected end that He has promised. In the waiting period I have even asked Him if He remembers that I am on still on the planet, as there seem to be no answer to my prayers. During those periods thoughts often cross my mind questioning whether He will do what He has promised. In those weak moments skepticism and cynicism gushes through my spiritual veins like blood as it is being pumped from my fearful heart. I have however, learned that I am not alone in this waiting game. 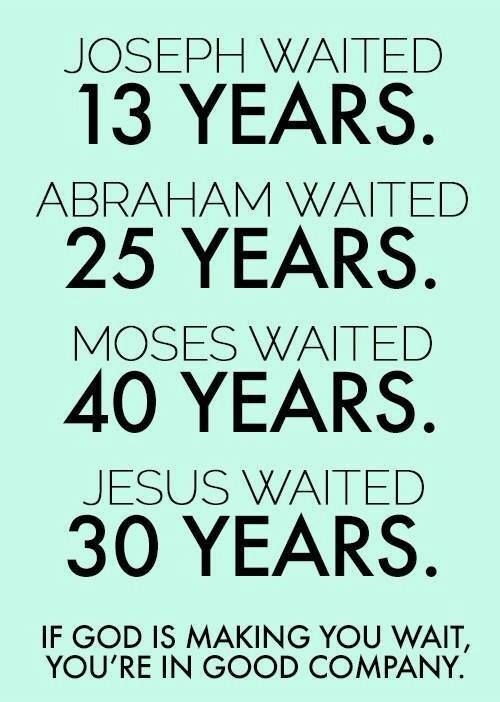 As a matter of fact there has been many heroes whose stories have been told in the Bible about their waiting process. Therefore, I have been comforted as it pertains to waiting as we will all have to do this at some period in time. However, I still need to perfect by countenance to having an excellent spirit during the waiting period. There are many examples of how to wait with an excellent spirit in the Bible. The story was told in the Bible of Hannah who was barren and was waiting on God to bless her with child. During her period of waiting she was ridiculed, tormented, and mocked continuously by her adversary. In this story however, we never read that Hannah cursed her adversary or acted out of character because of what she endured. Instead, Hannah took her burdens to the Lord in prayer. She lengthened the cords and straightened the stakes of her faith in God. She choose to starve her fear and doubts and allowed her roots of confidence in God and His ability to go down to the water table where her trees of fruitfulness could grow and produce much fruit. In essence, she ensured that through prayer her faith was anchored in God. By doing this Hannah received that which her heart desired the most. Prayer: Lord we ask that You help us to wait on You patiently. Continue to woo us until our love is made perfect in You. We know that when our love is perfected that all fears will be cast out of our beings. Teach us how to live in You. Help us to be confident in knowing that we will see Your goodness in our lives while we are living on this earth. Amen. A very timely post for me . Waiting can be difficult and I just have to let go and do it. Wait. In the world we live in I find I have less practice waiting than I did in my youth. Now I am impatient with the internet connection if I have to wait while sending an email. what about when I was younger and I wrote a letter out by hand and then put it in the post and knew it would take 10 days or two weeks to go across the ocean and then another two weeks before the person would reply and I would receive the reply. Good grief! I didn’t; expect it to be instantaneous. I had to wait. 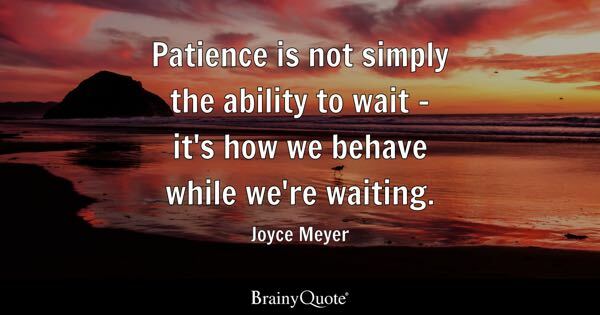 Thank you for this reminder that waiting is a skill and I must consider how I behave while I am waiting. Hi Anne. Thank you for reading. Yes waiting can be difficult. I really appreciate you sharing the experience of writing letters and waiting on a reply. Yes the use of technology has nurtured anxiety within us and we have been brainwashed in getting things “now”.